Years ago I considered myself a runner. I was never very fast and I never claimed to absolutely LOVE it but I put in a lot of miles every week and I had a full marathon, a handful of halfs and countless 5 and 10K’s under my belt over the course of twenty years. But then I stopped. Life intervened. Stuff happened, injuries became consistent, I discovered spinning, and before I knew it, ten years had passed. Occasionally I’d try starting up again but never made it past the first few weeks. My husband would suggest I buy new shoes (he is perpetually hopeful!) and I would, but they always eventually become walking shoes…time and time again. A few months ago said husband decided he was going to run three back-to-back races here in Nebraska, a series known as the Double Half Mary +5. He started off with a 5-miler on Friday night, then followed it up with a half marathon Saturday morning and another half on Sunday morning. I went with him as support and was surprised to find myself missing being someone who was lining up at the line, waiting for the gun to go off, signifying the start of the race. I wanted to be part of that community again. And so, four days later, I laced up my very old running shoes and started again. I made it five minutes the first day before I had to walk. Once again, my ever-supportive and ever-hopeful husband suggested I buy new shoes. He also suggested I read a book called Born to Run by Christopher McDougall. He knew the book would inspire me and he understood that new shoes would encourage me. He was completely correct on both accounts. 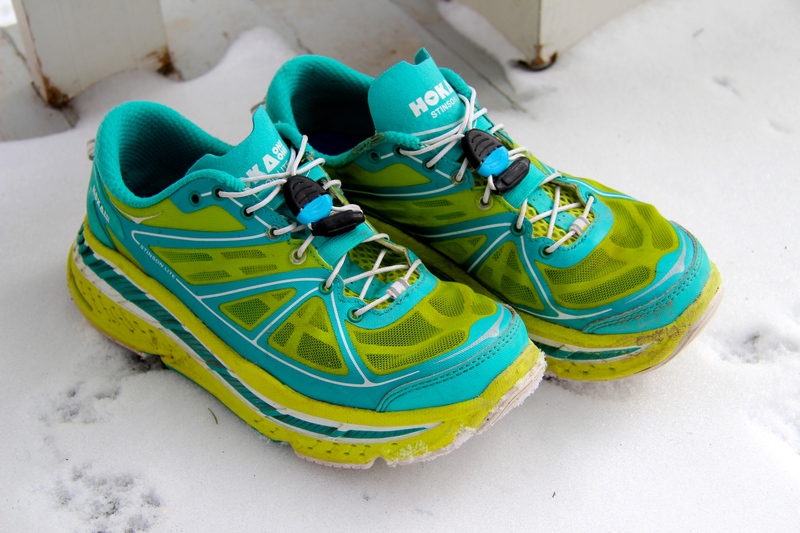 And really, who wouldn’t be motivated to run with shoes that look like those Hokas?!? They make me happy just having them on my feet! The shoes are great….the new way of running, mid-sole as opposed to landing on the heels, has made running less jarring on my joints….that’s all working. Winter is the main obstacle. I love a winter run and would much rather run in the cold than the heat but this week’s -25 wind chills and winds gusting to 25 miles an hour have proved to be daunting. 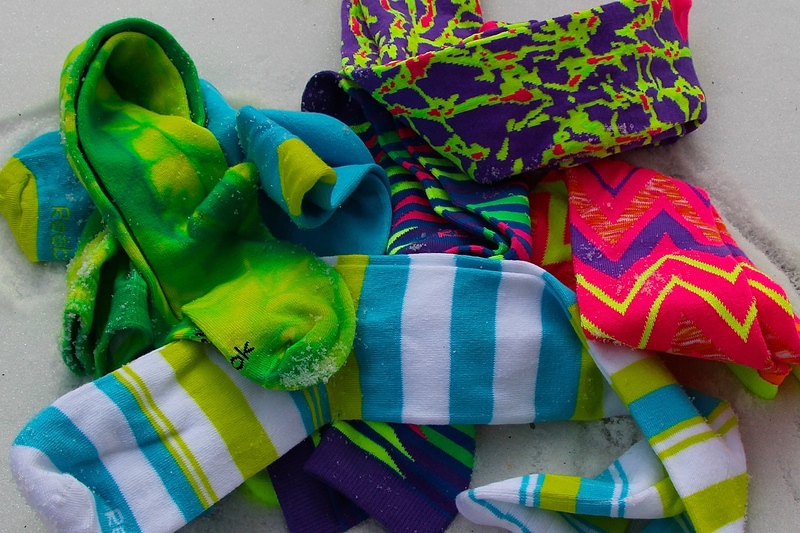 So….I bought new running socks. Knee socks to help keep my calves warm. Crazy, happy colors and patterns to keep my soul inspired, my body motivated, and a smile on my face…even if it is covered up with a face mask! The weather here in Nebraska is bound to break soon and I’ll get off my “dreadmill” and take these babies to the street. In-between those shoes and these socks, you can see me coming a mile away. It just might take me a while to get to you. New was the word among bloggers and the subject of this week’s photo challenge on WordPress. What’s new in your new year?